This stunning Batik Bagus collection by local independent designer Phabo Ragen draws its inspiration from traditional batik designs and would complement those planning a Ethnic & Cultural ceremony. 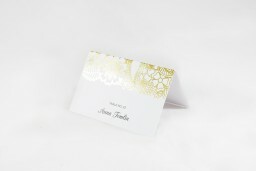 This Place card from the sophisticated Batik Bagus design collection looks fantastic when printed using Metallic and here at Paperlust we think it looks best on Paperlust Matt. This card makes me feel like I still belong to my roots. I love how the designer has created a card by giving it a cultural look and making it stylish too.